The SIG P320, introduced in 2014–2015 has proven to be a solid success, most notably its acceptance by the U.S. military. It’s also becoming popular as a police duty sidearm, and as a home and personal defense arm with private citizens. 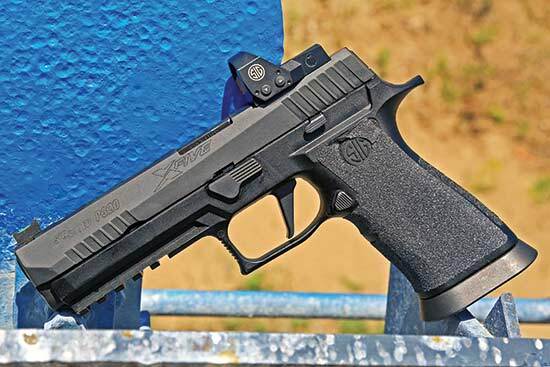 Introducing the P320 was a bold step for SIG. Their well-proven P220 series is highly regarded by handgun enthusiasts. Although the family resemblance is certainly there, the P320 is a quite different design. Where the P220 series used an external hammer and double-action trigger, the P320 is striker fired. The P220 series receivers were made of aluminum alloy while the P320 modular design uses a polymer grip frame with a stainless steel operating system insert. From the beginning the P320 was designed as a modular system. The basic stainless steel component can be used with a variety of slides, barrels and grip frames. Users can choose grip frames to suit different hand sizes, full-size pistols for open carry in duty holsters or compact versions for concealed carry, all in a choice of 9mm, .357 SIG or .40 S&W. Competition shooters will be especially interested in the X-Five version of the P320. When my buddy Steve Johns mentioned he had been setting up an X-Five for competition, I jumped at the opportunity to try it out. Summarizing, the P320 X-Five is reliable, handles beautifully and is easy to shoot straight and fast. The inherent accuracy is absolutely amazing. It shoots as well as some top-of-the-line .22 match pistols I’ve owned. The X-Five version of the SIG P320 comes with an adjustable rear sight which on this pistol has been replaced with the SIG Romeo 1 optical sight. 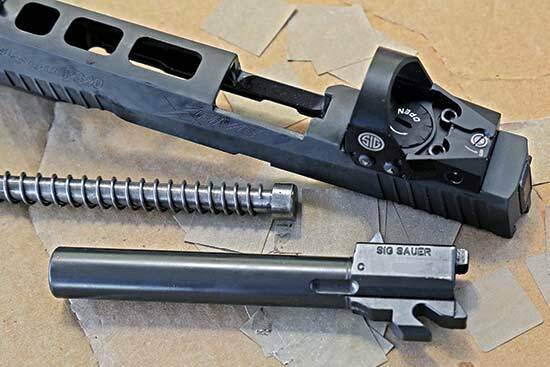 Shown with the P320 X-Five slide, the tungsten guide rod from Springer Precision adds a bit of weight and allows the use of widely available 1911 recoil springs. Steve Johns has been a good buddy for more than 30 years. I still recall the first time I saw him at a match. Steve was right out of the super fast, athletic, rat-a-tat mold. He was also cocky, aggressive, with enough self-confidence for a dozen shooters. Steve absolutely blistered through the stages and would have won easily, except he still had to learn accuracy counts too. It was a lesson I had learned long ago. I won the match by a comfortable margin. One of my better memories is the look of utter astonishment on Steve’s face when he saw the results posted. He exclaimed, “Do you mean to say the fat old guy beat me?” Since I wasn’t yet 40 at the time the “old” rankled a bit. On the other hand, since then Steve has called me “The FOG,” not a bad nickname and until now no one else knew what the letters meant. Soon after, I arranged for Rob Leatham, who knows talent when he sees it, to do a training seminar for a few shooters at our range. I remember as we were driving home after the seminar, Rob warned me, “Watch out for Stevie. If he puts in some hard training and learns accuracy and discipline he’ll be giving you fits in a year or so.” Right both times, Rob! The background reminiscing is included to explain why Steve’s enthusiasm for the X-Five P320 really got me interested. Steve can shoot, and he has campaigned some very fine custom guns over the years. Both of us need new knees and can’t compete with the youngsters in running and jumping, but we can still shoot! The X-Five has a 5″ barrel and corresponding slide. The top of the slide has three lightening cuts to speed slide travel. Out of the box it had a straight trigger, magazine-loading chute, extended grip tang, easily accessible magazine release button, fiber optic front sight and an excellent adjustable rear sight. At a suggested MSRP of $1,005 it’s not inexpensive, but considering how well it’s set up, and the fact it comes with four 21-round magazines (or four 10-round magazines if required by law), it’s a remarkably good value. Especially as it’s as accurate as custom guns I have costing three or four times as much. Steve has added a few touches including the SIG Romeo 1 red dot sight, and a Bruce Gray trigger with pull weight around 3.5 lbs. and a quick reset. He added a tungsten guide rod from Springer Precision too. The guide rod uses 1911-style recoil springs that are readily available in various weights. Recoil and muzzle rise with 9mm ammunition was minimal, and the accuracy was incredible. Several times, shooting from a rest at 25 yards, four shots were in less than 1/2″. Frankly it’s just as well we always seemed to manage one flyer an inch out, or no one would believe it. I barely believe it myself. This is a remarkable pistol. Simply by changing from optical sight to rear sight, the same gun could be used for both Open and Standard/Limited divisions. And after the match you could swap in a compact grip frame, a shorter slide and barrel — maybe even chambered for a different cartridge — and turn it into a concealable carry gun. Very impressive. Thanks to American Handgunner for this post. Click here to visit AmericanHandguner.com. Click here to follow Handgunner on Facebook.